Win more in your preferred way. You can customize various settings, including weight, lighting color and pattern, DPI, scroll wheel mode, commands and macros, and even the most responsive optical sensor. Get maximum tracking accuracy from Logitech’s most responsive optical sensor (PMW3366). 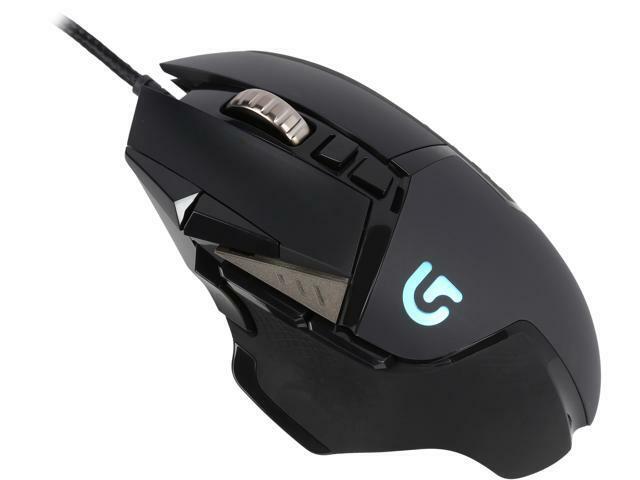 Exclusive Logitech G Delta Zero optical sensor technology minimizes mouse acceleration and increases reliable targeting. Switch DPI modes on the fly - choose from five settings from 200 to 12,000 DPI*. Pros: I have large hands and this mouse is a perfect fit. Never had an issue with the software simple and intuitive. Very well made. Cons: Absolutely no cons whatsoever. Other Thoughts: This is my second mouse for another gaming rig I recently made. I've had that logitech for years of hard abuse and works just as good as this new one I purchased. Will never buy another brand. Other Thoughts: This is the first mouse I have found where my fingers were not hanging over the ends. The design is just awesome and well thought out. It works great with everything I have tried it on. I will have to buy a couple more to have on hand for the future. Pros: Very comfortable for people with larger hands. Multiple buttons to allow many options for games. Other Thoughts: I highly recommend this mouse. Pros: Pretty, weighty, and a nice lighting effect without being too slutty. Cons: Yeah the mouse wheel is super annoying. I don't know who thought a continuously rolling mouse wheel was a good idea, but I wholeheartedly disagree. It's also super sensitive and reads input from even the slightest nudge. Other Thoughts: Here's to another great mouse. Hope it lasts as long if not longer than the last one did. Pros: Nice feel and accurate with great software support. Cons: After about a year the scroll wheel intermittently bugs out. Pretty useless in most gaming. Pros: Great software, highly tunable, good feel in the hand, super accurate in game (initially). Cons: RGB LED's in logo died inside of 1 week. DPI led's gave up after around 1 year. began randomly speeding up and slowing down DPI wise in all fullscreen games. Other Thoughts: after my 3rd set of drivers and trying to lock down DPI to just one setting through the software included, to no avail, I smashed it into about 20 pieces in the middle of my floor and pulled a decade old logitech MX300 optical mouse out of a drawer that works like a champion. Eventually replaced with ASUS GX950. Would have been outstanding if it didn't fall apart aesthetically almost immediately and then fall apart operationally forcing me to make it fall apart actually. Buyer beware, I did not abuse this mouse until it proved it's uselessness.